Gene Autry Tennis Center - Mesa, Ariz. Many of the Southwest's highest-ranked juniors got back into the swing of the tournament schedule at the Mesa Fall Sweet 16, one of the top point-producing junior tournaments on the calendar. More than 150 boys and girls in age divisons ranging from 10s to 18's competed in Mesa. The event was just singles competition, no doubles draws. In Boys' 18s - Unseeded Jason Jaruvang (Phoenix) had a spectacular week, taking out the No. 1 (Nicolas Montoya), 3 (Dominic Patrick) and No. 2 (Alex Lawson) seeds in succession to win the title. Jaruvang (right) capped his week with a 6-4, 6-7, 6-3 victory over Lawson (Tempe, Ariz.) in the final. In Boys 16s - Thomas Pecor (Scottsdale, Ariz.) downed unseeded Robert Seby (Oro Valley, Ariz.) 6-2, 6-3 in the final. The top-seeded Pecor dropped just one set, to third-seeded Augustus Ge (Phoenix) in the semifinals en route to the title. In Boys 14s - Tucson's Yash Parikh swept through his four matches without the loss of a set, including a 6-0, 6-1 victory over Nathan Brown (El Paso, Texas) in the final. Parikh took out the No. 1 and 4 seeds as well. In Boys 12s - Shawn Parks (Oro Valley, Ariz.) took out the No. 3 and No.. 4 seeds on his way to the Mesa crown, defeating Brandon Stringfellow (Phoenix) in the final. In Boys 10s - Unseeded Andrew Fucci (Gilbert, Ariz.) received a walkover victory over Arnoud Sewanou (Scottsdale) in the final. Fucci had disposed of No. 2 seed Luke Bridges (Mesa, Ariz.) in the semifinals. 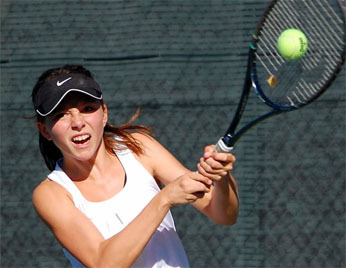 In Girls 18s - Unseeded Stephanie Vlad (Scottsdale) picked up two victories over top seeds Zaina Sufi (Tucson) and Courtney Amos (Tucson) in the semifinal and final respectively, to earn the Mesa title. Vlad lost just 16 games in eight total sets over four matches. In Girls 16s - Madison Clarke (Phoenix) - pictured right - downed Sara Parker (Gilbert, Ariz.) 6-4, 6-0 to pick up the 16s title. She lost just 14 total games in eight sets. In Girls 14s - Kylie McKenzie (Anthem, Ariz.) upended No. 2 seeded McKenzie Majerle (Paradise Valley, Ariz.) in the final, after shredding through the draw without the loss of a set. In Girls 12s - Chloe Weihs (Peoria, Ariz.) defeated Shailla Alda (Phoenix) in the best final of the weekend, 1-6, 7-6, 10-6. 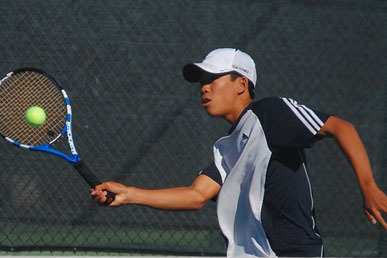 Weihs had also battled back in the semifinals to take out Albuquerque's Alexandra Ochotorena 3-6, 7-6, 10-6. In Girls 10s - Top-seeded Carmen Corley (Albuquerque, NM) eased past Maya Roderick (Tempe, Ariz.) in the finals 6-2, 6-3. Corley had some trouble against unseeded Elizabeth Isayev (Scottsdale) in the semifinals, but prevailed 2-6, 6-2, 6-1. *Photos courtesy of Randy Spizman. Thanks Randy! A sad note for the tournament: Mesa Tournament Director Tom Kenney's daughter Michelle Pagano was killed in a car accident late last week just before the tournament was held. She leaves behind a young daughter, Tea. In lieu of flowers, please consider a donation to an educational fund established for Michelle's daughter, Téa at any Arizona Federal Credit Union (account 805241), For more information, click HERE.